When you’re designing a new kitchen, it’s only natural that you’ll want to add a touch of luxury. There are several luxury appliances that you can add to your kitchen to achieve this luxurious feel, as well as making your life easier in the kitchen. Depending on your individual preferences and needs, your luxury essentials might vary. For many of us, getting a caffeine fix from a hot cup of coffee on a morning is essential – you just can’t function without it. If that’s the case but you’re not a fan of clutter on the worktops then a built-in coffee machine might be a worthwhile addition to your list. 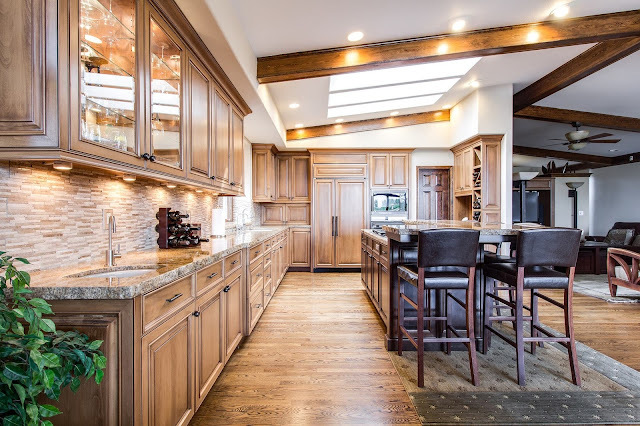 Although they might seem pricey at first, many aren’t much more expensive than top-of-the range countertop models and think of all that money you’ll save not buying a coffee on your way to work every day. If you’re planning an appliance bank in your kitchen then it’s worth noting that most manufacturers are designing coffee machines to match their ovens and as a result a combination of three ovens and a coffee machine are becoming a popular configuration. Price points vary, from the very affordable semi-automatic models from Hotpoint to the pricier all-singing, all-dancing bean-to-cup coffee machine from AEG. If you can’t bear the thought of messy beans or grinds, then a Nespresso pod machine by Miele is a good option. Whether you drink white, rose or red wine, you’ll know the importance of your wine being stored at optimum drinking temperature. Kitchens with zones for cooking, eating and entertaining are the perfect place for one of the latest luxury appliances – the wine cooler. While there might not be space for a wine cellar, the latest wine coolers are very sophisticated machines that will ensure all wines – both red and white are kept in the optimum conditions. Undercounter models from companies such as Liebherr, Caple and CDA vary in size from space-saving single columns to those with room enough for up to 48 bottles and featuring several temperature zones for keeping reds and whites at exactly the right temperature. Perfect placed on the dining side of an island so that guests can help themselves while you cook, look for coolers that also include UV protection and anti-vibration – to keep harmful light and stop the disturbance of sediments – as they’re important features to keep your wine at its best for longer. Larger models look great in a bank of appliances and many, such as those from Miele have elegant wooden shelving, three temperature zones and even a sommelier unit for sampling your best vintages. If you’re quite the dab hand in the kitchen, you’ll be aware of the importance of using the correct cooking technique for certain ingredients and dishes for the best outcome. With that in mind, if you’ve been seduced by the undeniable benefits of induction but can’t prize yourself away from the brilliance of gas for preparing stir-fried food, then incorporating domino hobs into your kitchen design might be the answer. These two-zone cooktops – usually measuring around 30 x 60cm come in a variety of different types. As well as gas and induction models, you can also buy charcoal-style grills for all-year-round barbecuing, steel tepanyaki plates for Japanese style griddle cooking and even fryers for perfect southern-style chicken. Whichever you choose it’s best to buy from the same manufacturer to keep the materials, design and size consistent. If you’d prefer to keep costs down with just one worktop cut, then AEG, Caple and CDA all have single glass topped hobs that include both a powerful gas burner and induction plates, proving that in some things, you really can have it all! Quite a new addition to the list of luxury household kitchen appliances, the hot water tap was introduced to the market following commercial models from companies such as Quooker. They began to show up in hi-end domestic kitchens for the main benefits of having boiling water at the drop of a lever. As a result, tap manufacturers began to develop their ranges, first with standalone taps and now the easier to include tri-flow monobloc with hot, cold and boiling water all in one, neat unit. Not just for making tea and coffee in a flash, combined with a super-fast induction hob, a boiling water tap can help you to prepare pasta and rice dishes in a flash as well as speedily steaming veg and fish. Most models heat the water to 98° but some, like those from Quooker reach 100°. Try also Grohe, InSinkErator, Franke and Zip for three-in-one monobloc models and Insinkerator and Blanco for standalone taps that are useful for prep sinks. Tanks vary in size but some are compact enough to incorporate into a small kitchen design and all designs feature child-locks to prevent accidental scalding.